That is the cutest cupcake! I don't have allergies, especially to cupcakes. I'm setting my TiVo for next Tuesday at 3PM to watch Lori make these cupcakes with Martha. I'm crossing my fingers + hoping to win some Divvies cupcakes! The chocolate chip coooooookies!These would all be great that my son can take to school. It's a no peanut campus. Bring on the oatmeal chocolate chip or the Kettle Corn! :) Yummers! I love Divvies cupcake delivery idea. Half the fun of cupcakes is decorating 'em! I saw Lori on Martha once before and immediately bookmarked the site - living in a small midwestern town, it's tough getting allergy-free or vegan anything! Oh my gosh! This is for me! I'm vegan and nursing my son that is allergic to nuts, dairy, & egg! I think I'd LOVE the caramel corn and pretty much anything else there! Divvies popcorn comes in the cutest boxes with little individual serving bags and a scoop... I love their chocolate caramel corn. The cupcakes look great, too! The Oatmeal Chocolate Chip cookies are so good you can't tell that they're allergy free! I must say that I would have to go with the cupcakes. They look so yummy and my little girl would love to decorate them. She really liked the picture of the cupcakes decorated for valentines day with the hearts and all the pink. Every thing looks delicious and there web site is clean and easy to navigate. I do wish that they would put the nutrition information somewhere. i absolutely love divvies cupcakes because everyone can enjoy them: they are vegan friendly, allergy free, and kosher. fun for everyone. Yummy! Cupcakes are our favorite, especially vegan cupcakes! I'm sure I would LOVE their caramel corn...but the cup cakes look good too! Their Jelly Beans...I bought two bags at DisneyWorld out of interest as my neice has a peanut allergy...she LOVED them! And so did I, it was so fun to FINALLY be able to eat treats with her!! Thanks! The oatmeal chocolate chip cookies sound so delicious! My kids would love the cupcakes! I think Nick's first true word was CAKE! Those oatmeal raisin cookies look so delicious!! Just looking at them makes me want to go make cookies! Oh you know I'm drooling over those cupcakes! And you can choose your own frosting and everything! Cool! Ok, I am seriously in love with the cupcakes!!! Oh my!! So yum!!! I love your blog...so much inspiration here. what a great story!! these cupcakes look yummy!! i would also love to try the chocolate chip cookies!! thanks so much!! Can't wait to see her on Martha, hope I remember! Would love to try to kettle corn or choc. chip cookies! YUM! My favorite is the oatmeal chocolate chip cookies, why? because I love oatmeal cookies and I love chocolate. 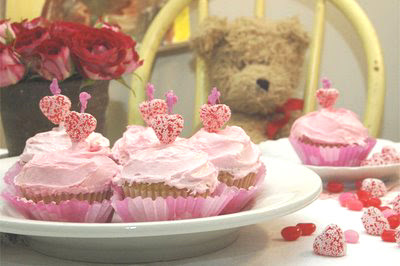 My daughter would love to decorate these cupcakes for a valentine's party! Omigosh. Allergy free cupcakes are for me. I have food allergies on top of being lactose intolerant so these are perfect. I've never tried Divves products but I could see the cupcakes quickly becoming my fave. I've never tried Divvies before but would LOVE to win the cupcakes (they look like the best treat to me!) for my friend's daughter's 2nd birthday. Their family has two children, both with severe food allergies, so I would love to give this as a gift to this hardworking mother, who is constantly trying to come up with new ideas to let her kids eat cake like the rest of us. Thanks for giving her this option! I like the cupcakes...the caramel corn...the cookies. Everything looks great! My favorite is their cookie gift set! Looks yummy. I have been vegan for quite some time. What a FABULOUS site! It all looks sooo good. Vegan candy...what a rarity! cupcakes are always my fave! It would definitely have to be cupcakes!! What is life without cupcakes?!!!! We have never before been able to enter for a food prize because we keep strictly kosher - until now! The chocolate caramel popcorn looks delicious! Those molasses ginger cookies sound so good right now! Divvies cupcakes are THE BEST!!! Being a cupcake-a-holic and vegetarian who is seriously contemplating becoming a vegan, this is the world's greatest contest! Hip-hip-hooray for vegan treats!!! The chocolate caramel corn looks decadent! We're vegetarian, so we would love those vegan cupcakes! The Oatmeal Chocolate Chips would be a hit here. I don't know which is my favourite because I've never tried them -- but I'd sure like to! Oatmeal chocolate chip cookies...my true comfort food. Wow! Everything there looks absolutely amazing. Choc Chip Oatmeal cookies... yum! And cupcakes. Oh my. Count me in please!! Thanks! I LOVE kettle corn... but the cookies also look delic! I have severe allergies, though I have shown no signs of having an food allergies - thank goodness! But, I love this concept & would love to win so I can test out these yummy cupcakes. My favorite divvie would have to be the kettle popcorn! Thanks for the chance to win! Happy Sunday! The chocolate chip cookies look scrumptous because there is nothing like a good chocolate chip cookie. I love the fact that my dairy-allergic daughter could eat some of these, too. Oooh...I am lusting those cuppycakes and want the choco chips for baking. Plus they have jelly beans, which my son LOVES, but I haven't been able to find any for the longest time that aren't "manufactured in a facility that also processes peanuts". Cupcakes are my favorite indulgence. Yummy!! These look fantastic! We'd love to have some in our house, they'd be gone quickly. We like healthier foods here. I've never had the chance to try these delicious treats, but thats about to change...right????! One work Yummy! I hope I win so I can share some of these treats!!! Yummy! I love cupcakes! What a great idea! I've never tried them, but they look great. They'd be a wonderful treat for my son who's allergic to dairy and our little friend who is allergic to eggs. What a fun treat for everyone! I'd love to try them! I've never tried Divvies (I wasn't aware of them) but I'd love to change that. The caramel chocolate popcorn sounds great to me. My son isn't allowed to bring cupcakes to school because of any allergies the children might have. These would be great to share with the class and introduce them all to Divvies cupcakes! Cupcakes are such a HAPPY fun food! Chocolate Chip Cookies (notice how I capitalized?!) are by far my favorite - I'd love to win some! It's definitely a toss up between the cupcakes and the kettle corn. To win any treat from here would be divine! Sarah A. They look scruptious! I hope they taste half as good as they look. My 2yo daughter is allergic to milk and eggs. We've got her chocolate capcakes for her B-day. Seeing her happy face all covered with chocolate was priceless! What perfect timing, as my DD's B-day is coming up, and while she doesn't have allergies, many of her friends do. I'd say the Chocolate cupcakes with pink icing would be our fave. We just found out my son is allergic to nuts and eggs, so the chocolate chip cookies would be perfect! He also has several food issues and doesn't eat a large variety of things, but I know he would love these cookies! Yum Yum. I'm all for the chocolate Caramel Popcorn, and I wouldn't mind buying some cookies, either! The oatmeal chocolate chip cookies look awesome. I've been lurking on the Divvies website for weeks while trying to decide if I should order these for my son's kindergarten class Valentines party! He's anaphlyactic to all dairy & beef--as a result, we spend a lot of effort making it up to his classmates since they can't bring treats for b-days b/c of him. The cupcakes look like they'd be a sure hit although I've got my eye on the chocolate caramel popcorn... I might just need to set up a subscription! Caramel!!! Seriously??? YUMMMMMMMMM! My favorite would have to be chocolate cupcakes with chocolate frosting! These would be great to take to my kids' school as fantastic allergen-free treats! Yippee! they're just classic & joyful! I love all of their treats. I found about them because my son's friend has gluten allergies and could not have the treats we baked every Friday. These treats allow for me to share my love of baked goods with our little friend/neighbor Nate. My daughter has a food allergy as well. I have heard these are delicious and would love to try them! Thanks Mod Mom! i don't have a favorite, but want to try the cupcakes. The jelly beans look yummy too...we love all sweets!!! The chocolate cupcakes with vanilla frosting look like they'd be the best because I love cupcakes and chocolate with vanilla frosting is my favorite. I have never had these before but they look amazing! I would love to try the oatmeal chocolate chip cookies. Wow...I can only pick one??? Everything looks so good. The candy hearts though look so tasty. Cool prize! However, Shannon is going to bump you off again if you don't link her to your site! I don't know what my favorite treat is as I've never tried any, however, those oatmeal chocolate chip cookies look good and so do those cupcakes. My son is allergic to nuts and dairy so this would be a great prize to win. I've never had vegan before, but those are darling! I'd love to win some. Thanks for the giveaway, how fun!!!! gormet popcorn, because I'm a popcorn FREAK! Who could resist such beautiful cupcakes? I would be in cupcake heaven! Oatmeal Chocolate Chip, all the way! I LOVE chocolate, that's why I'd pick those, but the oatmeal makes me feel like I'm eating something really healthy :-) And, well, I just love the taste! anything that has choclate is good in my book. those cupcakes look amazing. count me in. Have not heard of them before...so cannot pick a favorite...Love caramel anything, but children love chocolate. Have one that is going through allergy shots right now (allergic to outdoors and indoors) and needs to go through food allergy testing next...Oh Boy! Have a blessed day. This is the first time I've heard of them. Have to tell my SIL - her little one is allergic to everything. The cookies look amazing but so do those cupcakes. I'll definitely watch her on Martha. I have never had them, but they look delicious. Yummy, yummy! My son would love these! This look delicious! this would be my first time trying them. My son would love them! What a wonderful contest. My daughter has allergies to tree nuts, so it definitely limits what baked goods we can enjoy. Kosher an vegan? I am in heaven! I LOVE these...gorgeous cupcakes, and I think the cookies would have to be some of my favorites too. The molasses ginger cookies are the best! What a wonderful site! I bet it is a blessing to many families! I think the oatmeal choc. chip cookies look DELISH! Yummy....just what my 6yo with allergies would love! Thanks! Oh my goodness, I would go crazy for the chocolate - chocolate frosting cupcakes! And I don't even have an allergy (that I know of)! Oatmeal chocolate chip cookies sound delicious! I've never met a cupcake I didn't love. Oh, my gosh! I adore divvies. I think my favorite is their chocolate cupcakes with vanilla frosting (any color)--I'm usually a chocolate with chocolate kind of person, but these remind me of childhood birthday parties. I have divvies oatmeal chocolate chip cookies in the freezer right now, and my husband keeps sneaking them out for snacks! What a great giveaway! I really love the cupcakes. Vanilla with green icing would be really fun! The oatmeal chocolate chip cookies look divine. This is great. These would be perfect for my niece's birthday party coming up soon. She's allergic to peanuts and would love these. I haven't tried these, but the molasses cookies look yummy! I will tune into Martha. I have never tried this brand. This would be such a treat for the kids! Yummm...oatmeal raisin cookies. Thanks so much for the chance to win. This ia a great giveaway! The chocolate chip cookies and the kettle corn are my favorite Divves treats. I agree with many others, the cupcakes. I love that you get to decorate them yourself and that they are allergen free. Wow, what great cupcakes - hope I win! I vote for the chocolate chip cookies or the chocolate cupcakes (notice a trend?). Great prize! Thanks so much for the great giveaway. I would go with the Chocolate Cupcakes. I know my kids would like them best. Thanks again. I would love to try these! Although I do not have allergies, I do love cupcakes, and these just sound like a way better alternative! Love that they created allergy friendly treats that are so beautiful! I would pick the cupcakes - they look divine! Thanks! I would love the oatmeal chocolate chip cookies, just because those are well, my favorite! I want the chocolate caramel corn, but these cupcakes would be a great on. Thanks!! I've never had them, but those cup cakes look delicious. I'd love to brink them to my son's school party. It's so hard to find ready made, allergy safe foods! I've never had Divvies. Those cupcakes look great! I'd love to try the choc. chip cookies, too! oooo! yummy! count me in! The chocolate chip cookies look wonderful. But so do the cupcakes! They look scrumptious! What a great giveaway for a pregnant mommy to four! well, i would love the vegan cupcakes, but i'm sure my husband would love the kettle corn. thanks! These look so cute! I bet they're yummy too! I wish I could tell you what my favorite one is, sadly, I've never had a chance to try them. I sure hope I'll have the chance to, in the very near future ! The cookie gift box looks great! My son's best friend has peanut allergies and it would be wonderful to have a treat for him that I didn't have to worry about! My little sweetie has a milk allergy, would love to try these. The cupcakes are looking pretty good - and they have several options on their site (for cupcake combos). MMMM! mmmmmmmmmmmmmm cupcakes. Cupcakes are diet food. Right? count me in! I love cupcakes, no alergies! kettle corn!!! YUM YUM YUM!!! I'm so hoping I win this one! My daughter is allergic to eggs -- and it would be great for her to be able to eat such awesome looking cupcakes! I am so sad to say I have never tried Divvies before and feel like I am missing out on something big! I would love to win these cupcakes to try these gorgeous scrumptious looking treats out! How cool that they will be on Martha Stewart...I love her show! I can't wait to watch! Thanks so much for doing this! My nephew has tons of food allergies. . . this entry is for him! My daughter would love to decorate these cupcakes and of course eat them! As mom assigned a whole lot of cupcakes to bake for her peanut and tree nut allergic daughter's various activities the week of Valentine's Day - -well this prize package would be a gift to my sanity!! we've not tried divvy's yet (we've been making our own cupcakes) but I keep reading and hearing great things about them in my allergy groups! OMG so much to choose from. Chocolate chip, hmm no Oatmeal, nooooo chocolate cupcakes, carmel corn oh no!! I'll take anything! The chocolate caramel corn sounds devine! I love carmel popcorn AND chocolate, mix them together has got to be a good thing. Oh, my how awesome. Chocolate chip sounds so good right now. Oh My!! Wait I need to wipe the drool off my keyboard.I'm all excited now after looking at all those good for you sweet treats. The molasses cookies look good as well as the cupcakes and I love the fact that they have no hydrogenated oils. First off- THANK YOU MOD*MOM for passing this info on to us! We're a Vegan family that also has several allergies and it breaks my heart when I constantly have to tell my 2 year old daughter that she can't have something that all the other kids can. It's also great to know that these can be served worry-free to other kids! Huge fans of the cupcakes & cookies! Never heard of this before. Would love the oatmeal chocolate chip! I was so excited to see Divvies on Martha. We are Peanut, Tree Nut and Dairy Free due to allergies and when my daugther starts solid food we will need to be egg free for a time. While I've learned to adapt recipes it would be a HUGE treat to get to just eat some delicious treats without having to make them. I have not had any Divvies yet but just yesterday I ordered some Chocolate Chip Cookies and am excited to try them. anything popcorn is most popular here - especailly the kettle corn! Mmmm the Oatmeal Raisin cookies look so delicious!! I have giveaways on my blog too! Chocolate caramel popcorn sounds awesome! Thanks! Oh gosh, chocolate cupcakes with chocolate icing, chocolate caramel popcorn, oatmeal chocolate chip cookies...YUM! Their gourmet candies not only sound delicious, but look beautiful, too! Thanks for the chance to enter your drawing! Please enter me! ernestsgirl82@yahoo.com The blue rock candy looks great, but then so does everything else! The cupcakes. I am a sucker for cupcakes. These look so delicious! And it's nice to know we can share them with any of my daughter's friends without having to worry about allergies. Yummy! Well, gosh, I hope this isn't going to disqualify me. Because I typed something, but my entry doesn't look like it 'entered'. Love the cupcakes, but the chocolate caramel popcorn sounds really yummy. These cupcakes are awesome looking! We have so many kids in playgroup with food allergies it is hard to find treats to give them. This is perfect. On with Martha - how cool is that! The cupcakes look best, but the popcorn looks great too! The cupcakes look great! My son is allergic to milk so we have a hard time buying sweets for him, I usually have to bake something special just for him on holidays and special occasions. He had chronic ear infections until he was 4 and my friend, who is a dr, said he is probably allergic to something so we had him tested. He is now on a milk free diet and hasn't had an ear infection since! I had never heard of Divvies before this blog and Martha's show. They look wonderful and Benjamin is an absolute doll. After the cupcakes, of course, I'd like to try the chocolate caramel popcorn. Looks yummy! Thanks for offering these wonderful cupcakes. The cupcakes and chocolate popcorn look delicious! everything looks great, love the jellybeans! I would love to try the chocolate caramel corn - I've never heard of such a treat before! Why is this my favorite? I must say, chocolate and caramel is a winning combination, so I'm sure it tastes FABULOUS. Thanks! Oh, goodness, I feel so left out - I'venever heard of these yummies! How could I possibly pick, it all looks and sounds so amazing! !